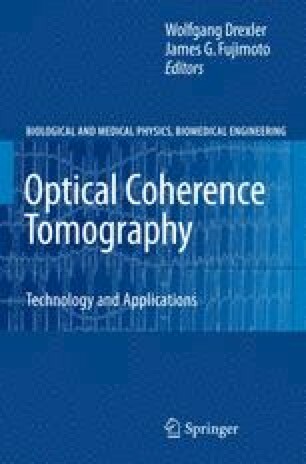 Optical coherence tomography (OCT) is an interferometric technique capable of noninvasive high-resolution cross-sectional imaging by measuring the intensity of light reflected from within the tissue . This results in a noncontact imaging modality that provides images similar in scale and geometry to histology. Just as different stains can be used to enhance the contrast in histology, various extensions of OCT allow for visualization of features not readily apparent in traditional OCT. For example, optical Doppler tomography  can enable depth-resolved imaging of flow by observing differences in phase between successive depth scans [3–5]. This chapter will focus on polarization-sensitive OCT (PS-OCT), which utilizes depth-dependent changes in the polarization state of detected light to determine the light polarization changing properties of a sample [6–11]. These properties, including birefringence, dichroism, and optic axis orientation, can be determined directly by studying the depth evolution of Stokes parameters [7–10, 12–16], or indirectly by using the changing reflected polarization states to first determine Jones or Mueller matrices [11, 17–21]. PS-OCT has been used in a wide variety of applications, including correlating burn depth with a decrease in birefringence,  measuring the birefringence of the retinal nerve fiber layer, [22, 23] and monitoring the onset and progression of caries lesions . In this chapter, a discussion of polarization theory and its application to PS-OCT will be followed by clinical uses of the technology, and will conclude with mention of more recent work and future directions of PS-OCT.